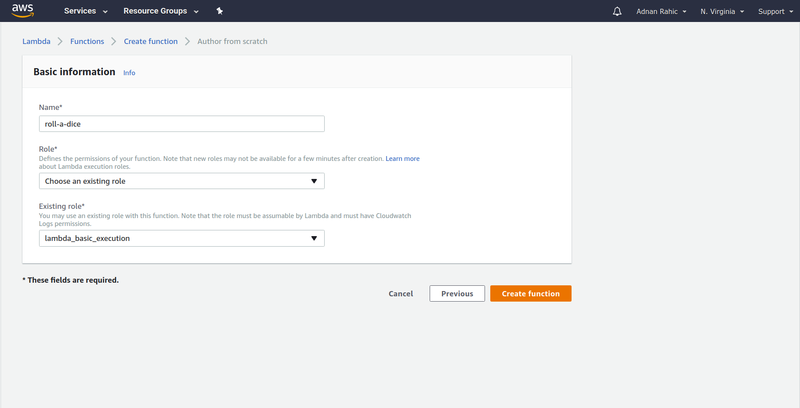 Every time an AWS Lambda function is created, a container is spun up to serve it. 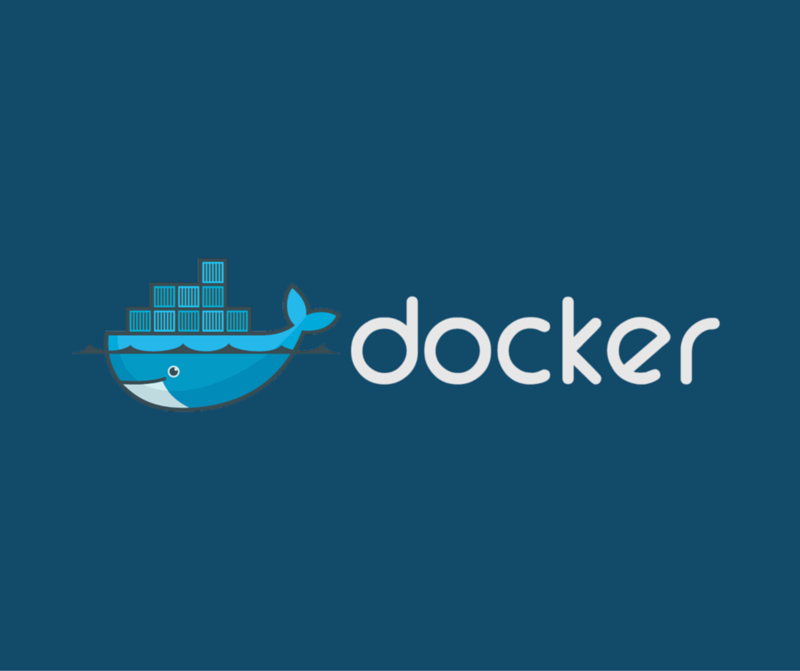 The code is deployed into the container and then executed. Hence making every subsequent request faster because AWS is skipping the initial creation of the container if it already exists. This will take you to the function blueprint picker. As this example will cover a basic function that will simulate a dice throw, let's forget about the blueprints and just author one from scratch. Awesome! Now you just need to add a name and role for the function and finally start writing some code. Regarding the role, feel free to just pick an existing role such as lambda_basic_execution. It will more than suffice for this simple example. Finally, go ahead and create the function. 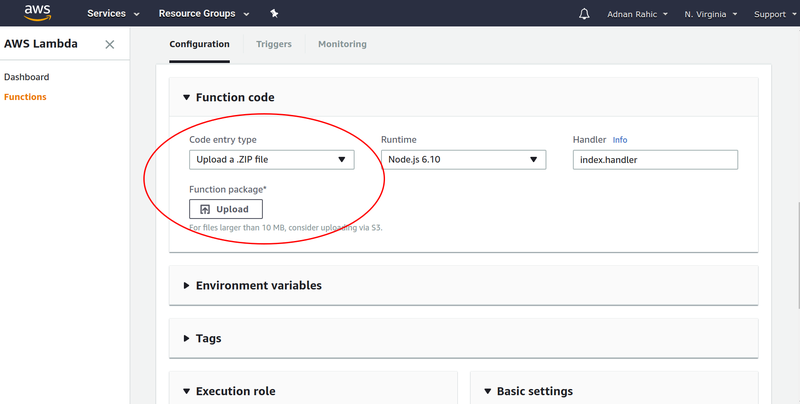 Leave the runtime as Node.js 6.10, which is the latest supported version of Node.js for Lambda at the time of this writing. The handler can stay the same as well. "index" stands for the name of the file, while handler is the name of the function. Check out the parameters the function takes. A bit strange, are they not? Let's break it down. That's enough with the setting up for now. Let's code something. Nice! That does the trick. Now the function will return a random number between 1 and 6. With that out of the way let's test it. Press the orange test button and proceed to create a "Hello World" test event. Give it a funky name for no particular reason. Just for the fun of having a test event named FunkyName. Now you can go ahead and test the function. After pressing the test button you'll see something like this. The section bordered with the dashed outline shows the function output, more precisely the value that got sent back by the callback function. Here comes the crucial part. 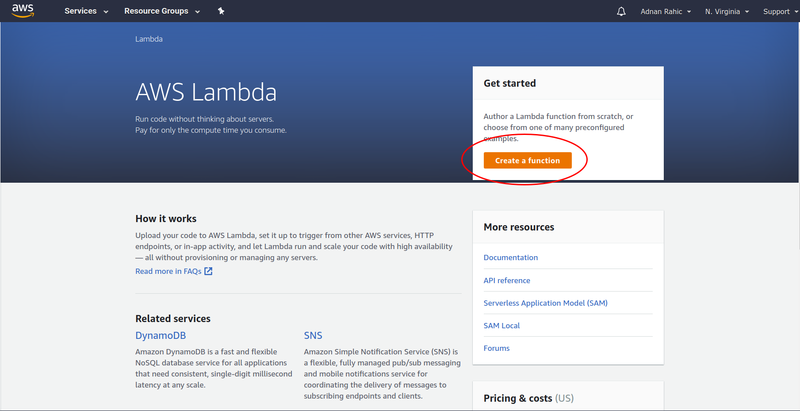 How do you think the Lambda functions know how to start its execution? Voodoo? Magic? No, sadly not. Every function invocation is triggered by an event. It can be an when an image gets uploaded to S3, it can be an Amazon Alexa skill, or just a regular HTTP request. Let's create an HTTP event and tell it to invoke our function. To be able to do this you first need to jump over to API Gateway on the AWS console. 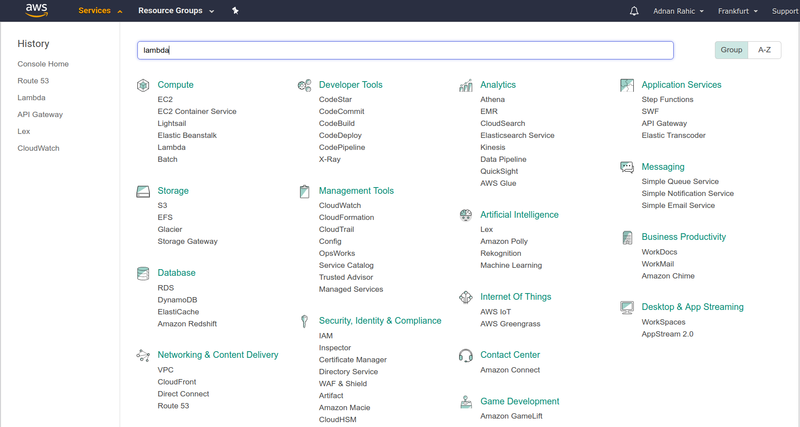 In the services dropdown pick API Gateway, and you'll land here. The API is set up and ready. You now only need to deploy it. 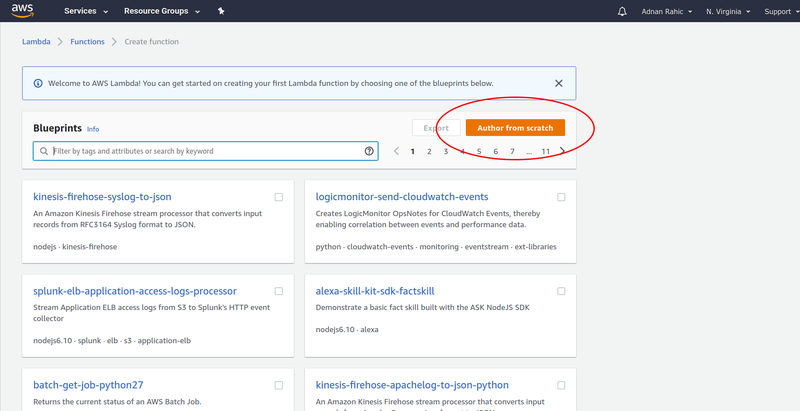 Press the Actions dropdown once again and and hit Deploy API. Pick a new Deployment Stage, write down dev as the stage name and you're ready to deploy the API. 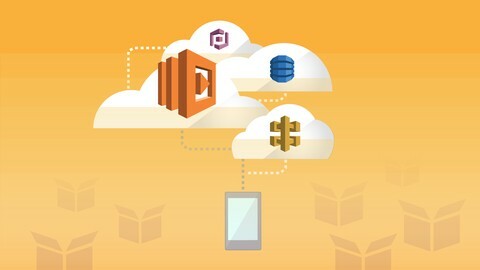 Want to learn more about Lambda, API Gateway, and other AWS services? Try taking a step-by-step training course to teach you how to quickly build fast, cheap, and scalable web services. 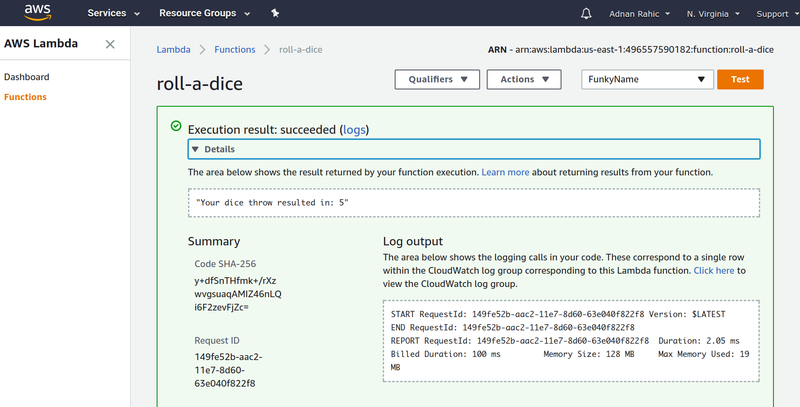 Lambda is an incredible tool which works well with an abundance of other services on AWS. 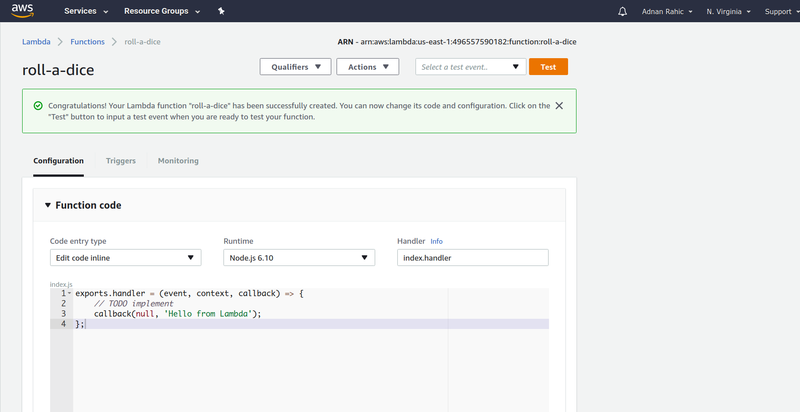 Lambda functions can be invoked in response to an event like file uploads, they can be used for chatbots, REST APIs and much, much more. Do you think this tutorial will be of help to someone? Do not hesitate to share. If you liked it, let me know in the comments below. Software engineer @bookvar_co. Coding educator @ACADEMY387. Campsite leader @freeCodeCamp Sarajevo.